When God put Mr. G and me together, it was surely a match made in heaven. In more ways than you can imagine. 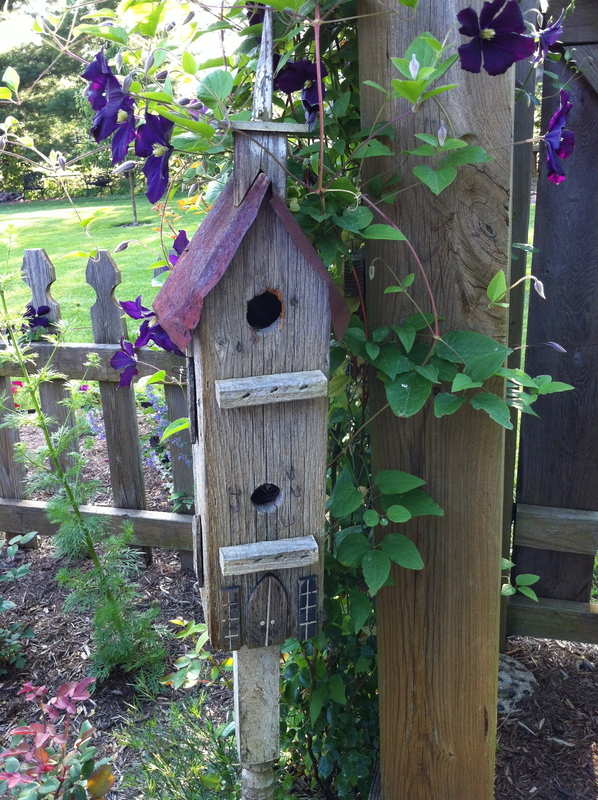 But, one of the most obvious ways is that I am a gardener and he is a builder. If I can dream it, he can build it. I’ll admit I’ve dreamed up a ton of stuff through the years! 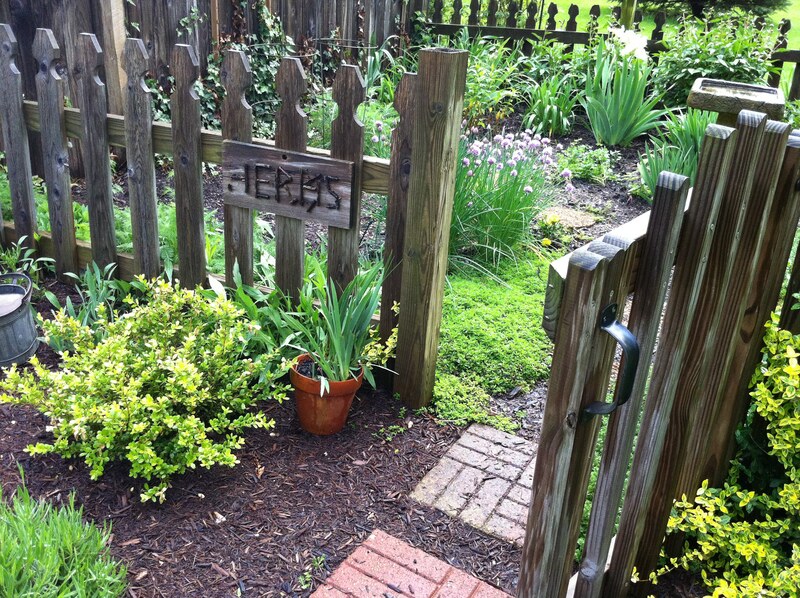 Last year “we” decided that the main gate to our garden needed refreshing. (Well, maybe that part was “I”.) 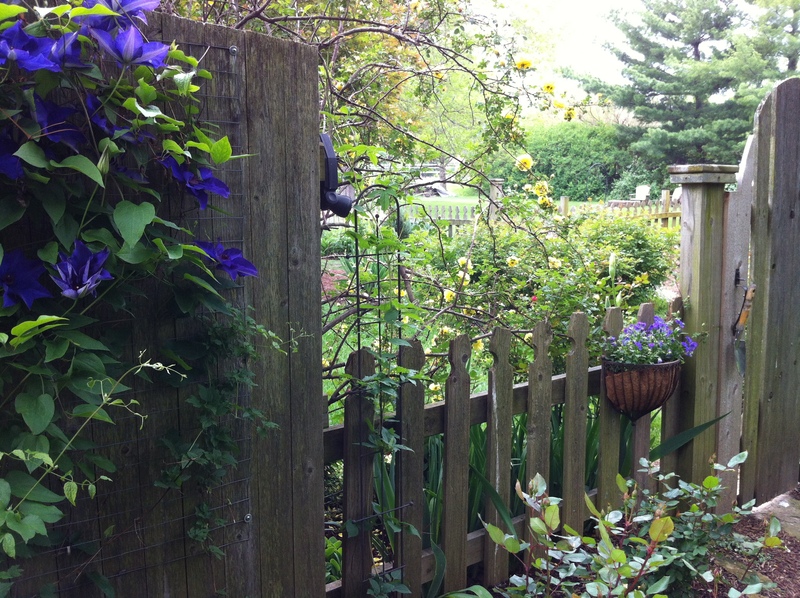 “I” wanted it to look more like the gate/trellis’ we had done for another area in the garden. The layout of the entrance is a bit different but Mr. G, the engineer, figured out just what we needed and started building in between rain storms a few weeks ago. Digging the post holes was a two-man job and our son came to lend a helping hand. From building snowmen to building gates, these two have worked on countless projects together and are a great team! It is now complete! I just love it! 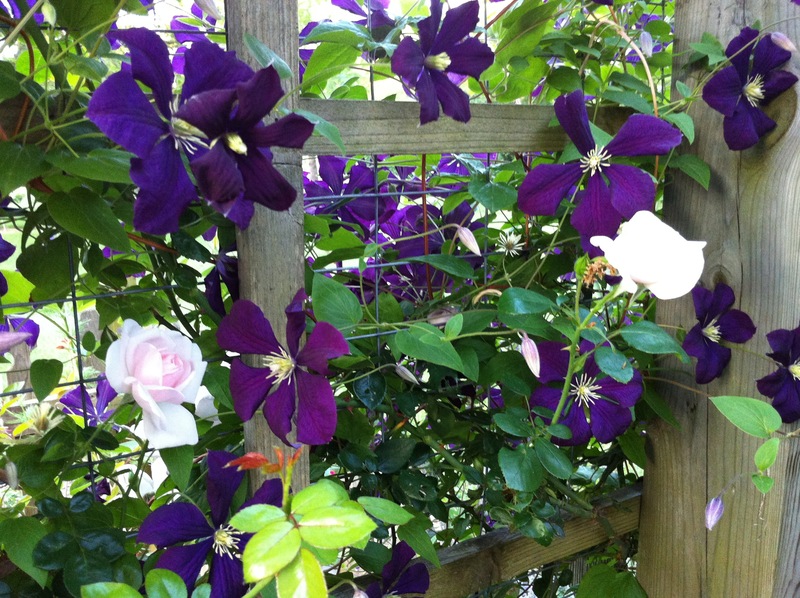 Time will give it the rustic patina we love and allow for the New Dawn roses and Etoile Violette Clematis to climb and wind and add their charm. This is New Dawn this week over the other main gate/trellis when she was going “up and over“. When she blooms she blooms. And, such a sweet fragrance too. 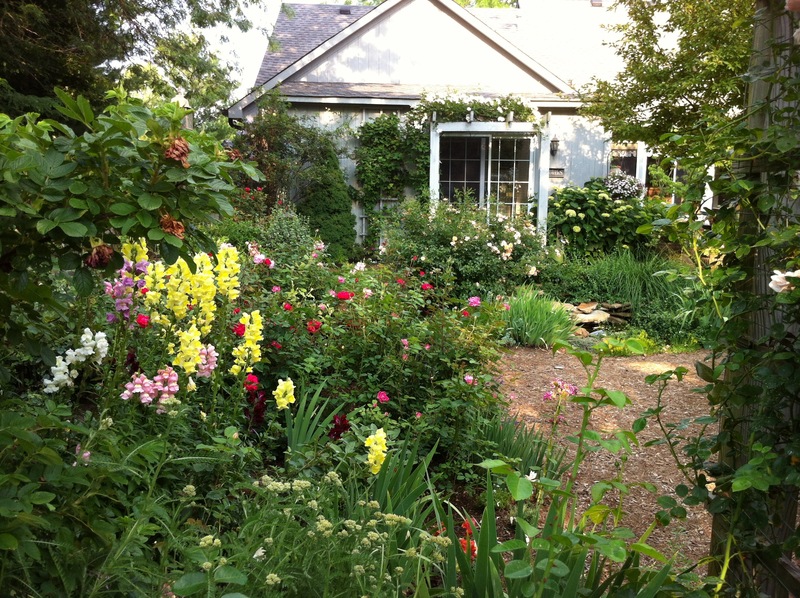 Behind New Dawn is the arbor with Francis E. Lester and Peggy Martin. Picture day for these was a rainy day, but they are holding up pretty well in all the rain. Good thing! 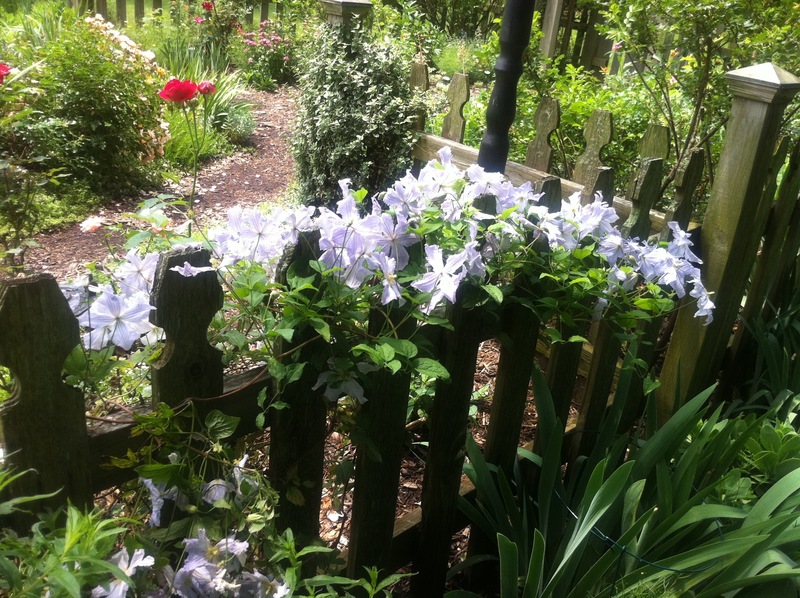 Yes, I have planted two New Dawns that will head up and over this new handcrafted “work of art” and two Etoile Clematis. 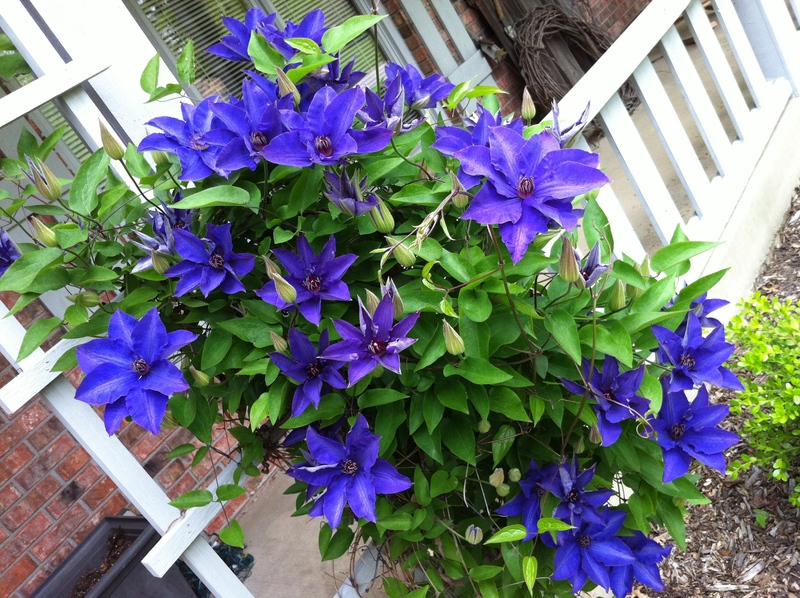 Blue Angel Clematis is already getting cozy! He is a true craftsman! 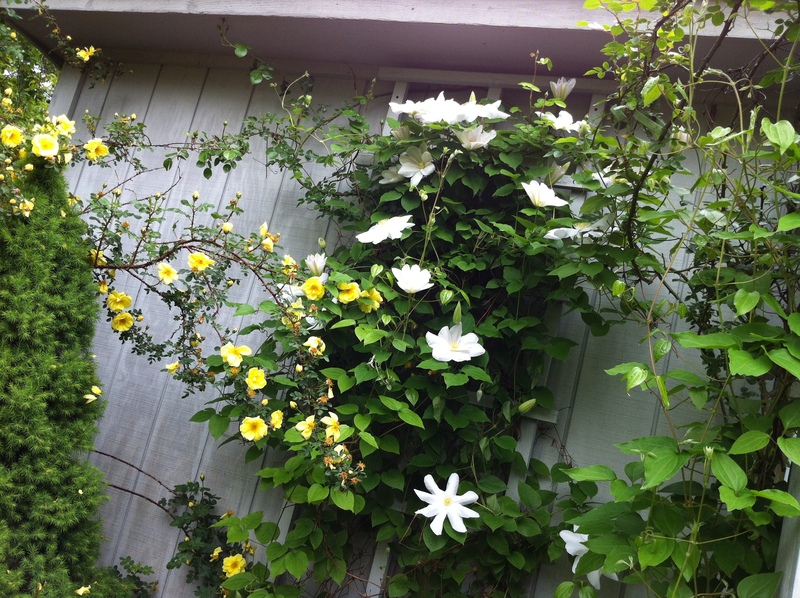 The roses and the clematis will have a firm foundation. And, our guests will have a “handcrafted” warm welcome! If you want to know more about “birth order,” read Dr. Kevin Leman’s book The Birth Order Book … Why You Are the Way You Are, immediately, from page 1 you will find yourself, your kids, your friends and yes your spouse. He will shed light on how these relationships work—with all the humor you can imagine. I read it back in the late 80s and even gave it to my children when they were in jr. high! You can purchase here. A fun and helpful read for only $12! Whatever your birth order, I wish you buckets of blooms, a sturdy foundation, a warm welcome wherever you go and an outstanding BLOOM THYME FRIDAY. For us in the midwest this was the year of the drought. For 9 weeks we had no rain. Most of the pictures of the entries for the 2012 Top Ten are before the drought began. 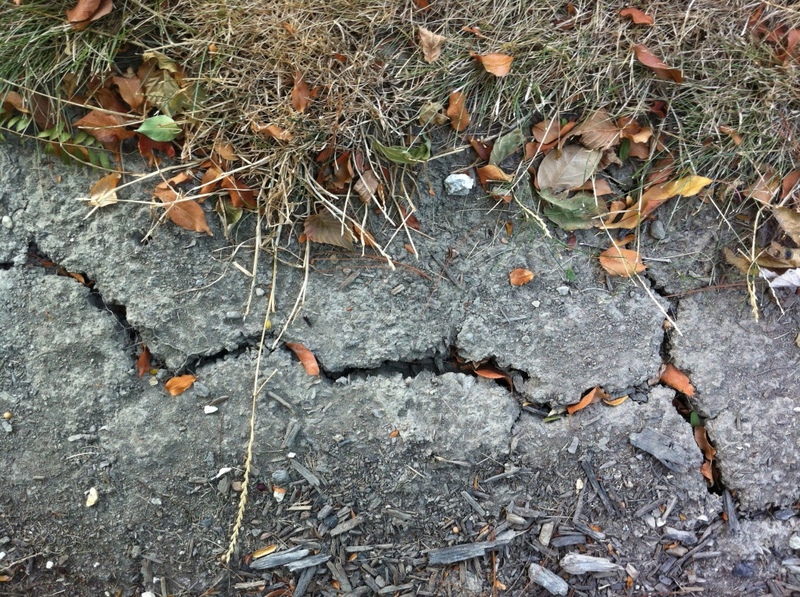 However, there are a few plants that rose to the top as a result of the drought. All in all, the drought made us more appreciative of everything we have. And, made us think of those in other areas of the world that have drought as a part of their everyday lives—our prayers go out to them! This picture was taken before the drought began. 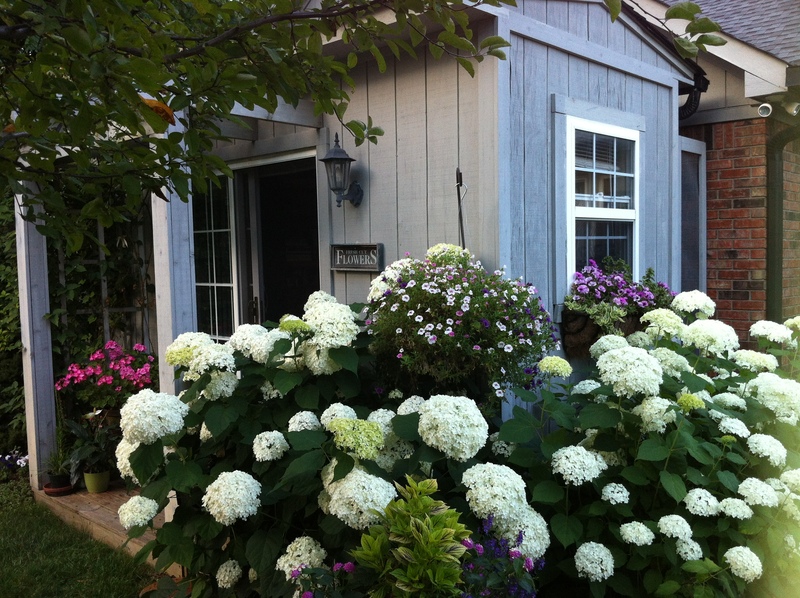 These hydrangeas are beautiful, reliable and long lasting. I just picked a few to have in the potting shed for the long winter that is on it’s way! This is a new rose to my garden but what a stand out! Bloomed and bloomed and bloomed. 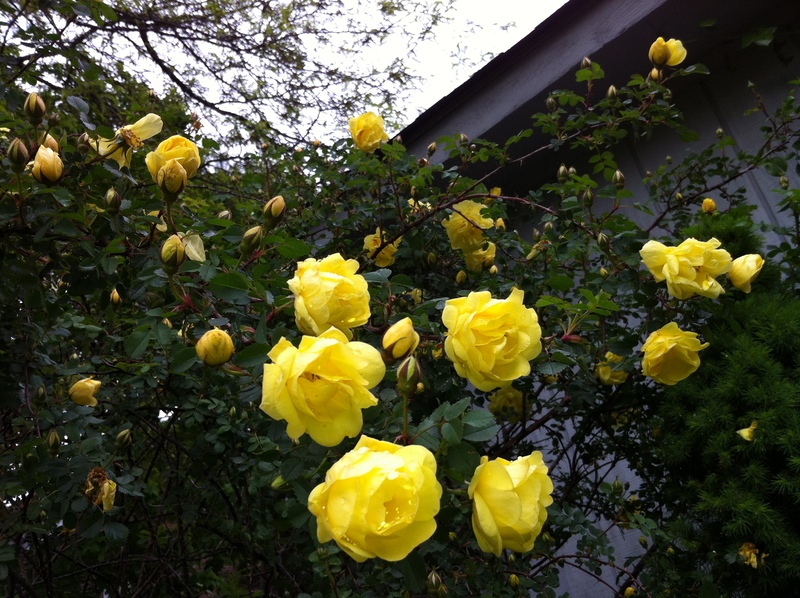 During the drought the roses were the plants that got most of the allotted water. I am so glad I planted Gene Boerner. 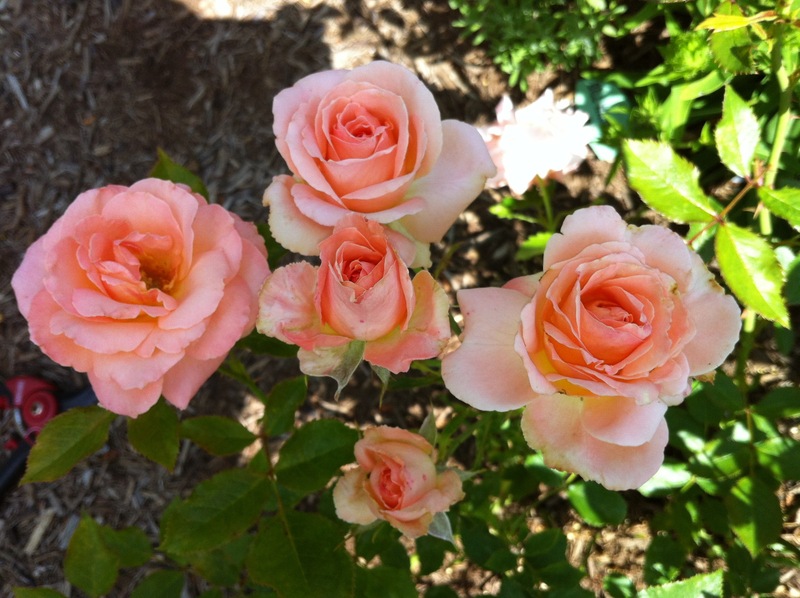 This rose was named for a Jackson & Perkins’ hybridizer who lost his battle with cancer. 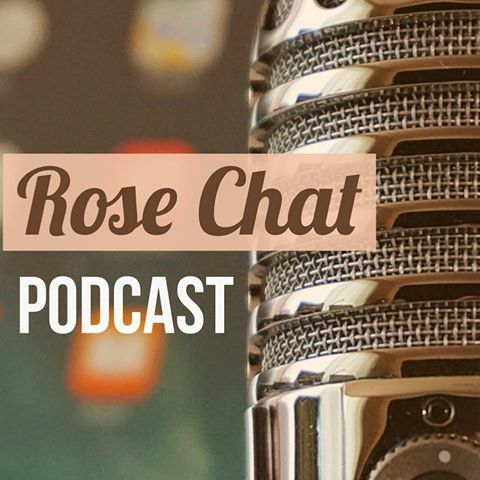 Our family lost a beloved family member to cancer too, so this rose is special to me. 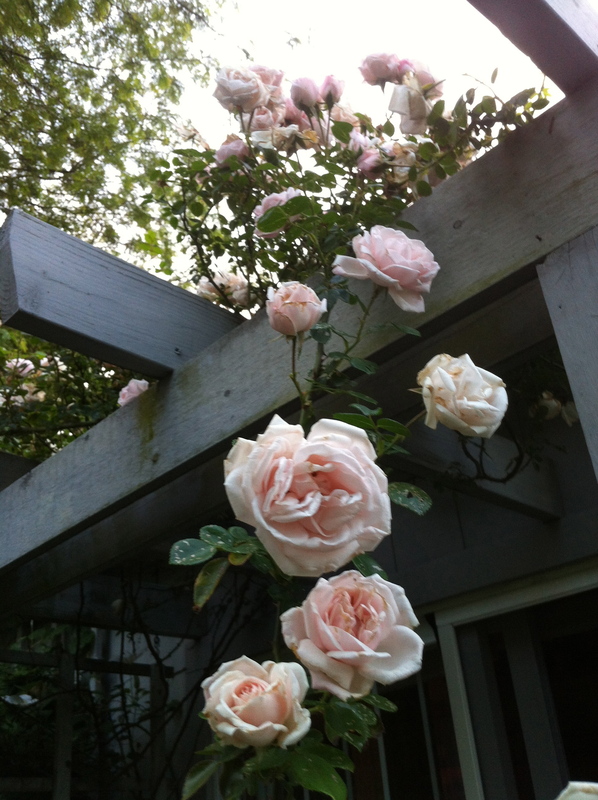 But, in and above all that, it is an amazing, fragrant blooming machine that is a standout in the rose garden. It was so hot and so dry when this picture was taken. I was grateful for every bloom! 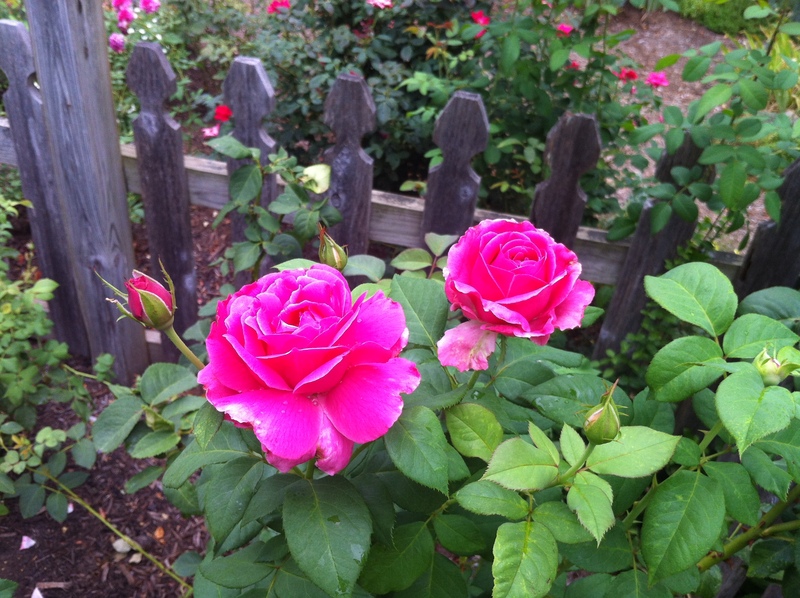 The Grande Dame is an amazing fragrant rose that wows in my garden! I have three of them and will probably have more. 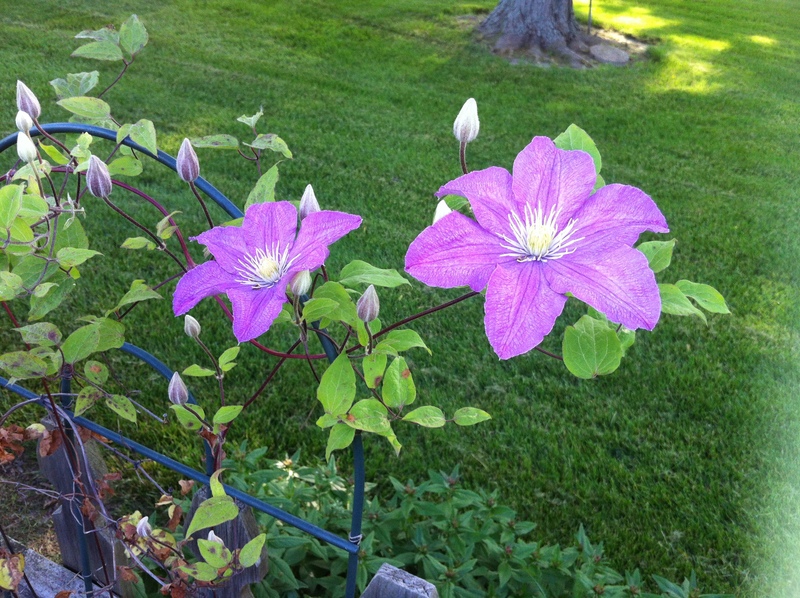 New Dawn bloomed before the drought began and was spectacular! 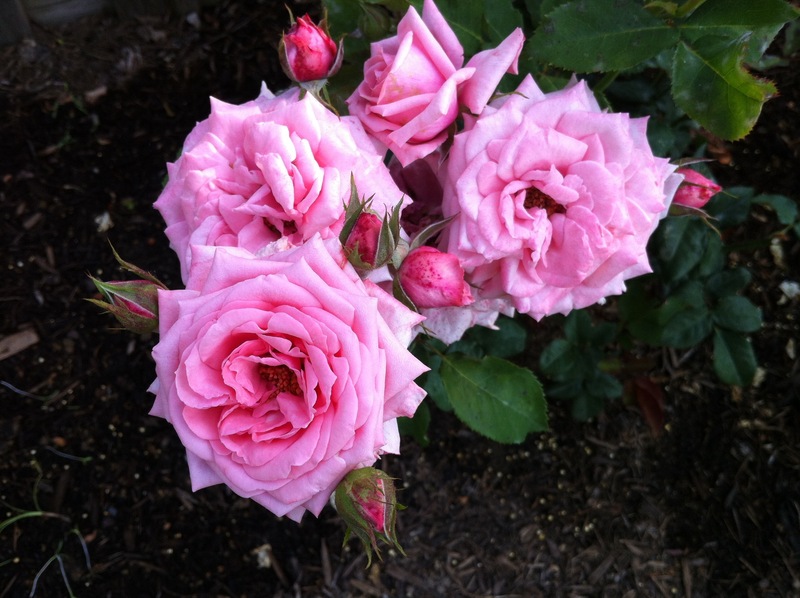 Soft pink, fragrant, tough and disease resistant. 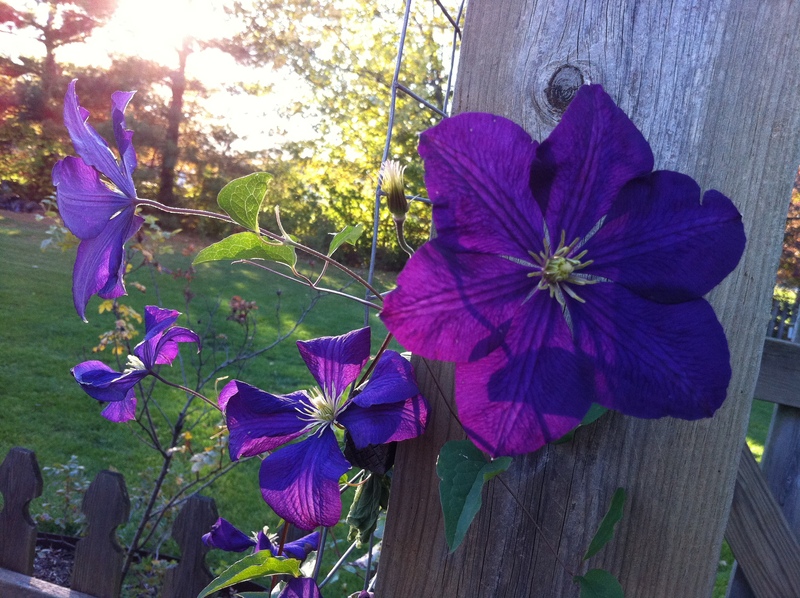 This is a climber that any garden would enjoy! For more on New Dawn, click HERE. 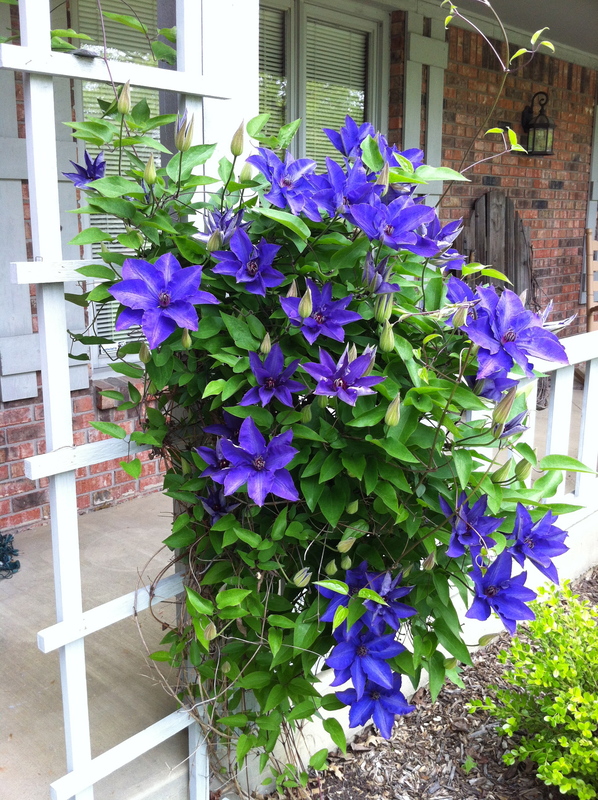 This clematis was a show stopper in early summer and just recently bloomed again making it completely amazing in my book. I love larkspur. Larkspur is best when it self seeds. This year was one of those years when I planted seed AND there was plenty of self seeding going on from the year before. 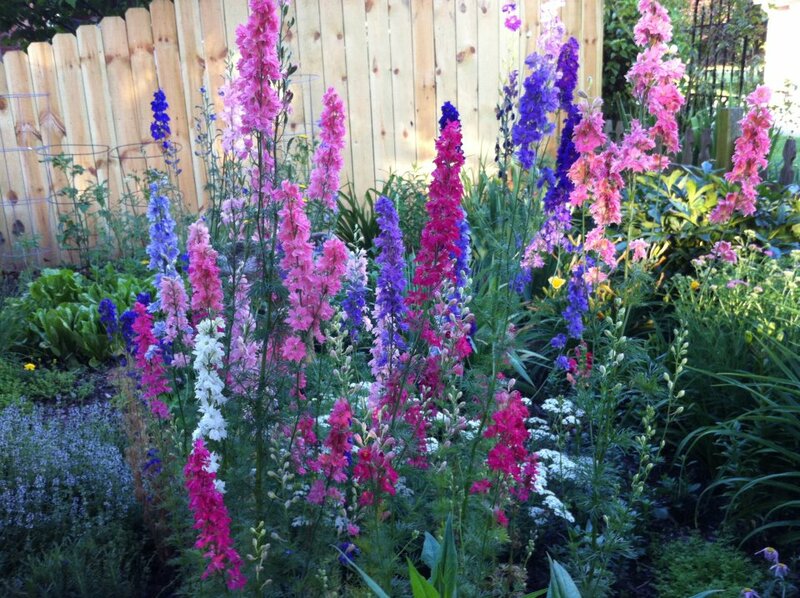 The larkspur was beautiful for a long, long time! 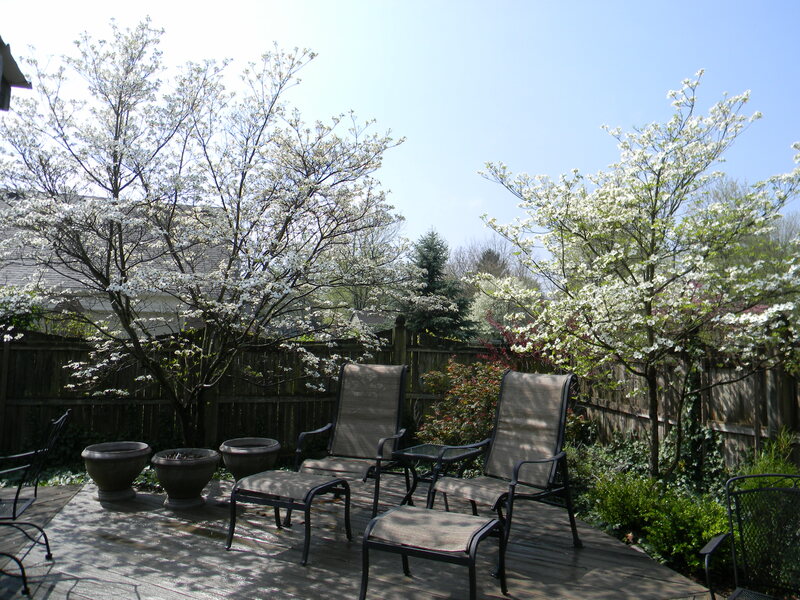 To get the whole story of why I love my dogwood trees, CLICK HERE. What a year this rose had. Spectacular in the spring and enchanting me completely with it’s history. Read about the history HERE.